Unbelievably difficult to photograph, will hardly hold still for a second. Luckily Belinda caught him off guard when he was taking a break. His name is Oliver (full name: Prince Oliver Schrodinger). 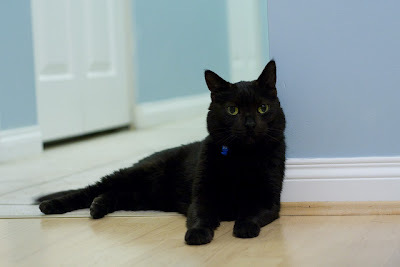 He’s a 6.5 year old domestic short-hair we adopted from the SPCA this weekend. He had been there since April, I guess most people don’t like adopting older cats as much as they like the cutesy kittens. He’s an extremely affectionate and well mannered cat. I hope he will enjoy his new life and home.